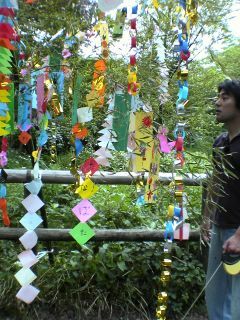 A few weeks ago, all over Tokyo, leafy bamboo branches festooned with paper wishes began appearing in public places for Tanabata, or the Star Festival. This special day all began with a Chinese legend about a girl called Vega, whose only fault was that she was a little too into her weaving. In a rather weird unfatherly move, Vega's dad actually got worried about his daughter and hooked her up with a cowherder named Altair, another workaholic. But the two crazy kids took one look at each other and promptly forgot all about cows and weaving. Which you'd think would make Dad happy, right? Sigh. Suddenly there was too much lovin' going on and not enough weaving and herding. And that made Dad mad. So he separated the two youngsters by a deep river (a river that could possibly have been the Milky Way, and these characters may have been celestial beings, but as is the case with legends, who knows?) and only let them meet once a year, which has since become the day of Tanabata. Talk about cruel and unjust. I mean, whose idea was it in the first place to play matchmaker? Anyhow, originally, people would hang little colored strips of paper on bamboo branches, praying that it would not rain, because if it did, the river would flood and Altair and Vega wouldn't be able to meet. Well, time passed and people seemed to forget about the lovers and started hanging up their own personal requests instead. From what I can tell, this seems to have evolved into something of an event for children, who write their wishes on hand-made paper decorations and fasten them to a communal bamboo branch. In our park, the most common wishes came from the more career-minded toddlers--"I want to become a lawyer," wrote one. Another child seemed to have his or her heart set on becoming a dango, which is essentially a ball of pounded glutinous rice. A third child asked to be allowed to eat limitless amounts of ice cream--good one. 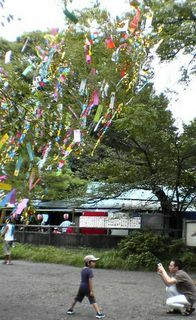 There are different ways of celebrating Tanabata in different regions of Japan. In some areas, there are large festivals in the streets. Some people even end the day by throwing the decorated bamboo bough into the river, in the hope that any bad luck will be swept away by the water. It's rather sad though, isn't it? I was struggling very hard to remember the Mandarin name of this story - Niu2Lang2 Zhi4 Nu3. Don't think we celebrate it as a holiday, but definitely there's a lot of paintings and dances inspired by this folktale. Personally, I think Dad had a right to get mad - one's gotta work for one's living, you know. Hsin, yes, I think that's the chinese version of the story. There's also another version of lovers separated, and they meet once a year, and I think that's mooncake festival isn't it? I could be wrong, but I guess it all seems a lot more romantic this way.. I'm slowly starting to get you. A "neat" type, a hard worker, and a pragmatic soul. You sided with the dad! Nan, isn't every other Chinese story about two lovers separated in some sad, endless way? God, so depressing. But then, I guess it's a rather universally loved tale. Hi Rachel - I enjoyed reading your post. It reminded me that I *had to* write wishes when I was at kindergarten :) I don't think I wrote 'I want to become a lawyer (or dango - love it though), but we enjoyed the festive event anyway. Did you see Hikoboshi and Orihime this year? Keiko, I didn't know they forced the poor children to make wishes. That's no fun. Regarding Hikoboshi and Orihime, is it truly possible to see stars in Tokyo?